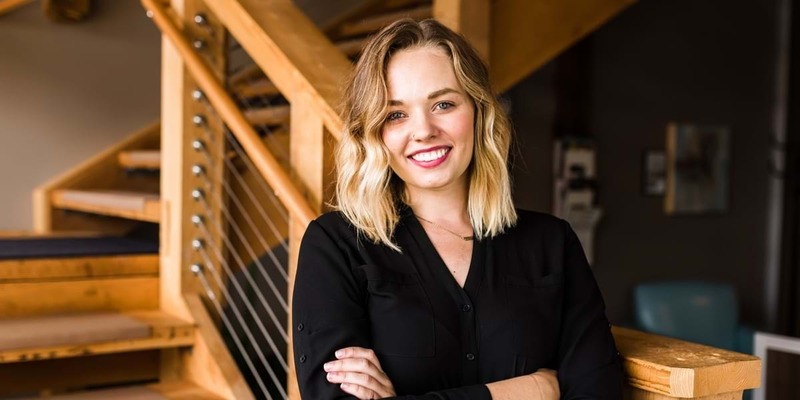 After completing a summer internship with an advertising and interactive marketing agency, Jodi graduated a semester early and returned to the agency as a full-time employee. She then followed God’s call to serve with Youth With A Mission (YWAM). She traveled to and shared the gospel in Mozambique; South Africa; and Amsterdam, the Netherlands – where she also served during a Spring Service Partnership during her time at Northwestern. Jodi now works as an account executive with Click Rain, a marketing technology agency. What led you to pursue a public relations major? I had a great experience planning a large fundraising event in high school, so I arrived at Northwestern knowing PR would probably be a good fit for me. After my very first Mass Media & Society class with Professor [Ann] Minnick, I knew I was where I needed to be. I quickly became passionate about learning how to communicate well, and I liked that I could choose a track at Northwestern that best fit my interests. The mix of business, writing and art classes I took prepared me well for landing in the marketing world. Why study marketing and public relations at a liberal arts college? My liberal arts education provided me with a foundation in subjects far beyond marketing and PR. Strategy, writing and design are important to creating a great marketing campaign, but the things I learned in general education courses are equally as important as I interact with clients in a variety of industries. My internship was an extremely valuable element of my education. The advertising industry is incredibly dynamic, and it’s impossible to prepare for its pace and intensity in a classroom. Having an internship where I was able to get first-hand experience enabled me to make an educated decision about where I wanted to be after graduation. My internship also gave me three months of great opportunities to network and learn from talented professionals. How did your time at NWC prepare you for your time with YWAM? I was thankful, during my time in YWAM, for the solid and faith-based foundation that I had from both my Christian upbringing and my Northwestern education. I didn’t expect to move away from the Midwest and embrace a whole different way of life in a season of full-time mission work, but I know that the Lord was preparing my heart through community living, faith-based academics and campus ministry opportunities at NWC. Tell us about your role at Click Rain—including your work with Northwestern College. My role as an account executive combines project management (like planning meetings, communicating with clients on day-to-day needs, building timelines and tracking budgets) with more tactical marketing technology duties (like building email campaigns, posting on social media channels and making content updates to websites). The best part of my job is getting to know our client partners and understanding the “why” behind what they do. I especially love that I get a front row seat to see how Kingdom work is being done in so many of the different industries we work with—restaurants, healthcare, retail and higher education, to name a few. I was thrilled to begin working with Northwestern shortly after I started. I know firsthand the impact that the faculty and faith-based curriculum had on my life. We work with NWC to craft and execute strategies that will reach prospective students who will benefit immensely from a Northwestern education.